“Inside each and every one of us is true brilliance. It is deep down in your very core. Capture the essence of your being and bring it into creation ~ Explore and Expand ~ to touch the world with your magnificence." 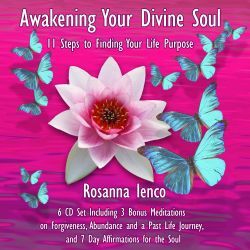 "Rosanna's inspiring story will take you on a fascinating voyage of self-realization and personal transformation. Follow the eleven steps to finding your life purpose and you will discover your true essence." ~Bob Proctor, from the movie The Secret and best-selling author of You Were Born Rich. 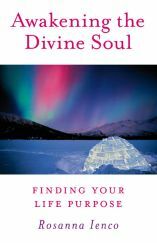 Describing Rosanna's book, author of the New York Times bestseller Your Destiny Switch Peggy McColl wrote: "Awakening the Divine Soul will lead you to a life of fulfillment. 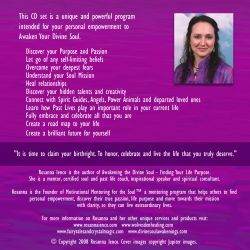 Allow Rosanna's journey of self discovery lead you to yours." Read what other reviewers have said about this book. 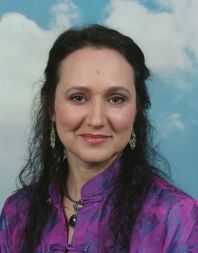 Discover Rosanna's workshops and mentoring programs or Learn more about Rosanna. For further details, e-mail me.